Up to 2004, we have established a global network of 8 assembly facilities for corrugator﻿ machine components (key components system, cardboard production system, carton box manufacturing system, and others auxiliary conveyor equipment system), and 10 branch offices for marketing and service. All these efforts are put together to make marketing global; production efficient; and service local and handy. 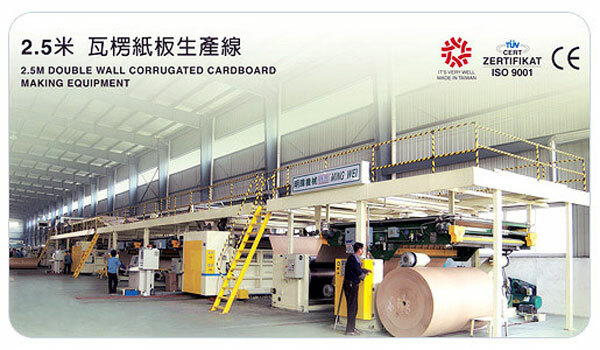 Founded in 1986, Ming Wei Co., Ltd. in Taiwan has had experiences for over 20 years in paperware machinery by providing corrugator﻿, printer slotter and related cardboard making equipment.﻿ Under the lead of Mr. Liu Ming Chung as well as the unison support demonstrated in the hardworking attitude of all the employees, Ming Wei Paperware Machinery Co., Ltd. has always sought to upgrade itself in research and development, quality control, and after-sale service. This continual effort has secured Ming Wei a leading position in the field of paperware machinery in Taiwan. Very early on, Ming Wei obtained ISO 9000 certification from the paperware machinery like sino corrugated equipment, printer slotter and series of corrugated machine﻿, in addition to a CE certification for security and safety. Hence, in 2000 and 2002, we were twice awarded Taiwan quality goods prize issued by Taiwan government, which is the first and only award so far given to companies in the paperware machinery industry. Furthermore, in 2002, Mr. Liu Ming Chung, was awarded "Model Chinese Youth Entrepreneur", and received subsidy for the first place from a project competition for "New Product Innovation and Research" awarded by Industry Bureau, Department of Economy. These honors that came in succession have proven that our business operation, product innovation and excellent quality, have been well recognized by the government and the business world here in Taiwan, which few could keep pace with. Ming Wei Company is the founder and standing chair of "Max Group". We organize the elite enterprises in corrugators and through mutual support, we aim for total solution for our customers all over the world!